The Freestyle optium H system, which uses biosensor technology to monitor the effectiveness of blood control programmes, is ideal for use by medical professionals. 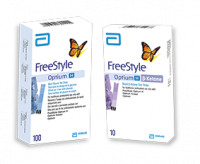 To Recieve updates and possible rewards for Abbott FreeStyle Optium H please sign in. To Recieve updates and possible rewards for Glucometer please sign in.